.... The Christian hope is not defined in terms of a lifetime of happiness that lasts 80 or so years and is at best partial, intermittent, and hit or miss. Rather, the Christian hope is for nothing short of perfect happiness that literally lasts forever and answers our deepest longings for satisfaction and joy. God wants to elicit our love and he has gone to the extreme length to demonstrate the depth of his love for us by sending his Son to die and save us from our sins though we turned our backs on him. Amazing as it is, we can resist his love and continue to go our own way. The notion that anyone would freely lock themselves in hell sounds incredible. Why would anyone do that? This is one of the most puzzling things about hell. 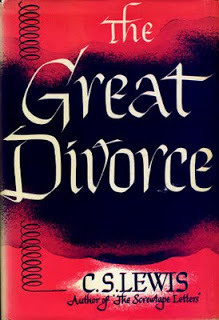 Lewis attempted to answer that question in a little book called The Great Divorce. If you want to read one book on heaven and hell, I would recommend this one. The premise is that a group of the denizens of hell take a bus ride to heaven and are given every opportunity to stay. Indeed, they are implored to do so. As surprising as it may seem, almost all of them choose to go back to hell. Why? Because they need to make some profound changes in their lives in order to enjoy the heavenly society of perfect love and joy. In particular, they need to give up various resentments, jealousies, attitudes of self-righteousness, and so on that they have been clinging to.